The gods and their followers make up an important part of any fantasy campaign setting. They provide the myths and legends of the world, and their religions help define the ways the people of the world go about their lives from day to day, month to month, and year to year. In Pathfinder and many other games, the gods also provide their most favoured servants with power, often in the form of spells, but also other unique abilities as well. Thus, having a well-defined pantheon of gods is integral to creating a coherent setting. The gods of the Pathfinder Campaign Setting world of Golarion have been developed over several years now, beginning as just a list of names and domains in the original Rise of the Runelords Player’s Guide, but were then gradually expanded upon with occasional articles dedicated to individual deities appearing in Pathfinder Adventure Path volumes. It wasn’t long before they got a book dedicated to them in Gods and Magic. But that book, at 64 pages, could only hold so much. It’s an overview, really, and as the campaign world has expanded and developed, that book has become less and less useful. There is far more detailed information available in the aforementioned Pathfinder Adventure Path articles and books like Faiths of Purity, Faiths of Balance, Faiths of Corruption, and Faiths & Philosophies. But one problem with all this information is that it is scattered across more than twenty different books, which can make it difficult to find when needed. Inner Sea Gods, a massive 336-page hardcover tome, helps rectify that problem and introduces lots of new material for both GMs and players. To be fair, some people may see a lot of the material in this book as a retread. It does compile the Pathfinder Adventure Path articles on the 20 core gods of the Inner Sea Region into one place, and that fills up the entire first half of the book. The information on the other gods is also mostly compiled from other sources, leaving about a third of the book to completely new material (mostly game options like new feats, spells, traits, and prestige classes). However, the book has done more than just compile the older information. It has also revised that information to bring it in line with the way the setting has developed and even changed since the material was first published. Gone are paladins of Asmodeus (well, actual lawful good paladins, that is; people claiming to be paladins of Asmodeus are still very much present) and Erastil’s misogyny, and numerous other small revisions can be found by those who look closely enough. Inner Sea Gods is really quite a remarkable book. The interior layout is absolutely gorgeous. More important than that, the content is full of flavourful information that will leave GMs with tons of material to create new NPCs and plots with. And although there’s a huge amount of information to absorb, it’s a fun and entertaining read from beginning to end. The first chapter covers the twenty core gods of the setting. 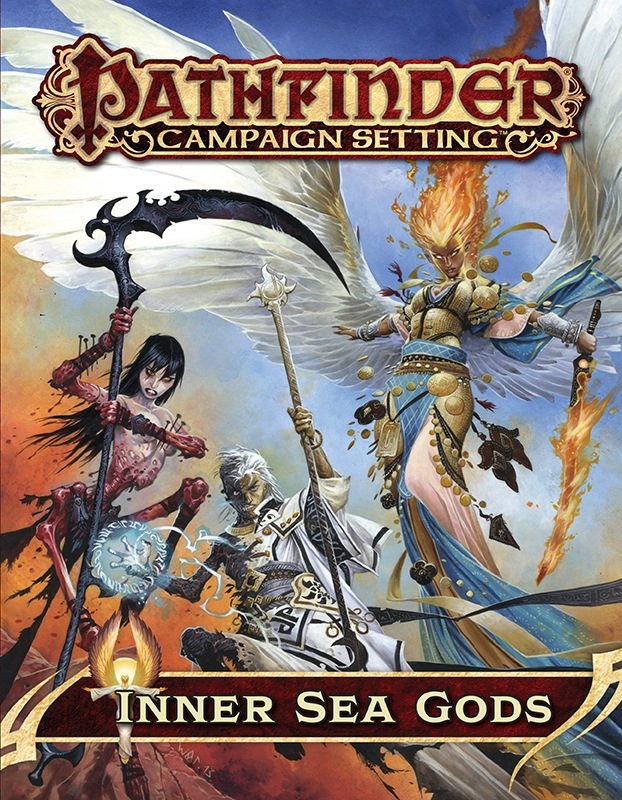 These are the same twenty gods that appear in the Pathfinder Core Rulebook as just a single chart of sample gods for clerics, and the same gods that each get a half-page description in the Inner Sea World Guide. Here, each god gets eight pages of detailed information. The information here mostly comes from those aforementioned Pathfinder Adventure Path volumes, but as I said before, that information has been revised and sometimes expanded upon to bring it all in-line with the current outlook of the campaign world and to make them a more unified whole. Some information comes from other sources, too, such as the paladin and anti-paladin codes, which come from the Faiths of... series of books. Each god’s write-up begins with an overview of the game mechanics for that god. This includes the god’s alignment, domains, favoured weapon, and so on. It also includes the god’s “obedience” requirements and “boons”. These refer to the Deific Obedience feat described later in the book. This feat follows the style of feats like Demonic Obedience (introduced in Lords of Chaos) and Celestial Obedience (introduced in Chronicle of the Righteous), where a character swears allegiance to a specific power and, by performing daily actions (called obediences), acquires added powers (called boons). Since celestials and fiends are capable of granting such abilities, it makes sense that the gods should also be able to grant such abilities to their most devoted followers. Indeed, the gods go one step further by offering three categories of boons (as opposed to just one offered by fiends and celestials), one for each of the three different prestige classes introduced later in the book. Each god’s section then continues with an overview of that god and his/her history, a look at the church (e.g. the god’s organized mortal followers), typical temples and shrines, the roles of priests, the kinds of adventurers that follow that god, clothing, holy text, holidays, aphorisms, relations with other religions, the god’s realm, and planar allies. Each section closes with a sidebar containing a list of relevant game options for followers of that god (such as archetypes, feats, and spells) along with the sourcebooks and page numbers where those options can be found. The sidebar also includes “Variant Spellcasting”, which provides minor adjustments to the spell list for clerics of that god. Several of the gods have other sidebars in their sections, covering other things, such as paladin and anti-paladin codes, or other details specific to those gods. In addition to having them all in one book, the best thing about compiling all this information here is the way it makes them all seem part of a cohesive whole. The earlier Adventure Path articles, such as Desna’s (which was the very first), had to include their relationships with other gods that were much less well-defined at that point. As those other gods got their own articles, they might sometimes make some of the earlier assumptions not quite work any more. The way was open for inconsistencies to creep in. This book helps remove inconsistencies. Unfortunately, it doesn’t always do that perfectly. A notable example is with Gorum’s age. Rovagug’s section refers to Gorum and Torag forging the Rough Beast’s prison. Yet the section on Gorum implies that he is a much younger god who came into being during first battles between humans and orcs. Also, the paladin code for Abadar, although reworded slightly from its appearance in Faiths of Balance, still refers to Abadar as the only neutral god with paladins. Much like the Faiths of.. books, there is no mention of paladins of Irori in this book, despite the fact that other books have material for such paladins: a prestige class for paladin/monks of Irori in Paths of Prestige and an archetype for paladins of Irori in the new book Inner Sea Combat (a book I’ll be reviewing in the near future). With such material available, it seems a little odd that Inner Sea Gods does not contain a paladin code for Irori (and indeed, no book yet published contains such a code). At the opposite side of the specturm, the anti-paladin code for Gorum, which is in Faiths of Corruption, is missing from Gorum’s section in this book. But while it’s unfortunate that a few inconsistencies have still crept through, this massive opening chapter of Inner Sea Gods does a brilliant job of resolving most problems that existed before—such as the oddity of paladins of Asmodeus. I love that these “paladins” are now simply people of other classes who just call themselves paladins (with the full sanction of the church of Asmodeus) and mimic the abilities of paladins through the use of spells and magic items in order to trick the general populace into being more comfortable with worshipping Asmodeus. The third chapter concentrates on game options, and there are quite a lot to choose from, starting with three new prestige classes for the most devoted of the god’s followers: the evangelist, exalted, and sentinel. Even though there are only three separate classes, the use of the Deific Obedience feat and the boons that are specific to each god means that these classes are a great way to customize the followers of every god. The evangelist can be taken up by members of virtually any class (although each god has classes that are more common than others), and it’s the only one of the three classes that I have any concerns about. It’s designed to allow progression in one of the character’s original classes simultaneously with progression in this class. Evangelists choose an “aligned class” and starting at 2nd level, they gain all the special abilities of their aligned class in addition to the evangelist’s special abilities every time they go up a level. In many ways, it’s similar to a mystic theurge or eldritch knight, except it doesn’t just advance spellcasting; it also advances all other abilities (excepting BAB, saving throws, and skill points, which all follow the evangelist progression: medium BAB, good Reflex save, and 6 skill points per level). Although evangelists do end up a level behind in their aligned class (since they don’t get this benefit at 1st level), I worry that this class could be open to abuse from those who know how to game the system well. I haven’t seen it in play, though, so I reserve final judgement until such time as I do. The other two prestige classes look as though they offer great possibilities (although, in fairness, I should point out that I haven’t seen them in play either). The exalted is a class for divine spellcasters, and is essentially a means to further customize clerics and druids, bringing their abilities closer to their respective gods’ fields of interest. Sentinels are élite warriors of the gods and, in many ways, offer the opportunity to create “paladins” of any alignment. Following the prestige classes are the new feats. As well as Deific Obedience, there is a large selection of feats, all with some kind of divine relevance. Most of these feats require that your character worship a specific god, although a few are open to followers of any god. After the feats comes a very comprehensive selection of religion traits, and then a selection of new subdomains. Naturally, there are also new spells in Inner Sea Gods. Most of these spells are associated with a particular god, but unlike the feats, characters don’t have to be followers of that god in order to cast them. However, followers of other gods must research the spells first before being able to use them. Some of these spells are revisions of spells from earlier sources like Gods and Magic, but others are completely new. In a game that already has more spells than anyone could ever keep track of (the same goes for feats), I really like that the spells and feats in this book evoke the feel of the gods they are associated with. They add colour in a way that generic spells and feats don’t. My favourite spell in the book (if I’m allowed to channel my evil GM side for a bit) is spawn calling. This 9th-level spell calls a spawn of Rovagug. The non-mythic version of this spell calls a thunder behemoth (from Bestiary 3) with the advanced and entropic simple templates. However, the mythic version allows the caster to call one of the named Spawns of Rovagug, such as the Tarrasque or Chemnosit, the Monarch Worm. This is the sort of spell that should probably never actually be cast in a game. It’s pretty much a “game over, bad guys win” spell. However, as the culmination of a high-level (probably mythic) adventure or campaign, it makes a great plot device. The spell has a casting time of one week, so GMs could easily make a great adventure where the PCs have only a short time to find the villain, get past all the guards and defences, and stop the spell from being cast before it’s too late. Of course, if they fail, then the villain finishes the spell and all hell breaks loose. If the PCs are high enough level (and have enough mythic tiers), they might still survive. Either way, it could be quite an epic conclusion to a campaign. After the spells, there is a large selection of new magic items, starting with magical altars. Each of the twenty core gods gets a magical altar specific to that god’s faith. What I like here is that these altars aren’t just standard table altars. They vary in appearance in ways that fit their associated gods. The altar of Erastil is a stone hearth, while the altar of Gorum is an iron platform for a suit of armour. The altar of Shelyn is a display case for showing art or musical instruments, and the altar of Sarenrae is a six-foot-tall golden statue of the goddess. As well as the altars, though, there is a large selection of other magic items from magic armour and weapons to rings to wondrous items. Most of these are also associated with a specific gods and followers of an item’s particular god can often access additional or greater powers. The final chapter of the book covers the servitors of the gods. It goes through the twenty core gods in alphabetical order again and provides Bestiary-style entries for the herald of each god and a servitor race for each god. Each entry is a single page. The heralds have all seen print before in the Adventure Path volumes containing their respective god’s article, although with the earlier ones obviously being updated to Pathfinder RPG stats as opposed to 3.5 D&D. Further revisions have also been made. For example, herald is now a creature subtype and has its own standard abilities. All the heralds in the book are CR 15 (except Rovagug’s, which isn’t strictly a herald) and all the servitor races are CR 4. This is a good way to allow characters of all levels to have some sort of interaction with godly servants. Unfortunately, with stat blocks taking up the amount of space they do, there’s not a lot of room for descriptive information about the heralds. Luckily, the heralds do get mentioned in the Planar Allies section of each god in Chapter One. However, even there, they only get a paragraph or two, so overall, you don’t learn a great deal about these beings. But considering how much this book has managed to cram into it already, this isn’t a major criticism. Oddly, the Prince in Chains (Zon-Kuthon’s herald) does not have the herald subtype even though he is referred to as the herald in Zon-Kuthon’s section in Chapter One, and there is nothing in the text of the Prince’s entry in Chapter Four to explain this, so I’m not sure if the Prince in Chains is meant to be a different sort of herald (one that doesn’t use the subtype) or if this is just an error. It’s one way in which the lack of space is detrimental, I suppose. As Rovagug doesn’t have a true herald, but instead a bunch a Spawn, the greatest of those spawn is presented in this chapter: the Tarrasque. Of course, the Terrasque is also in the Bestiary, so one might wonder why it needs to be here. The stats here present a Golarion-specific version of the Tarrasque (the Bestiary version is world-neutral) with slightly altered abilities and the Spawn of Rovagug subtype. Finishing off the book is an appendix containing a chart of all the gods, demigods, demon lords, empyreal lords and so on. This chart lists name, alignment, title, areas of concern, domains, subdomains, favoured weapon, symbol, sacred animals, and sacred colours for each god. It’s the ultimate quick-reference tool for creating new characters or needing information fast in the middle of a game session. One of the most important criteria I use to judge a sourcebook like Inner Sea Gods is how many ideas it gives me while reading it. Even though I have read all the original versions of the articles that fill up Chapter One, as I read through these revised versions, I constantly found myself thinking of new character and plot ideas. As I read through one god, I would come up with an NPC to add to a future adventure and then, as I read the very next god, I would think that maybe I should scrap the last NPC idea and replace it with a follower of this god instead (this does mean that Zon-Kuthon has an unfair advantage due to his name’s position in the alphabet). In my mind, there can’t be much higher praise than this. There are a lot of books available for Pathfinder and Golarion now, so it’s natural that some books are not going to see a lot of use. I know there are a lot of books sitting on my shelf that have hardly been touched since I first read them (even ones I like a lot), but I know that this book will see a lot of use. Indeed, it’s exactly what my games need. That’s also high praise. Sure, I can find some minor things to nit-pick, but overall, Inner Sea Gods is a great book. Great review. I'm still on the fence about whether to pick this one up or not. Those prestige classes sound interesting though. Good review. I seriously like the prestige classes centered around the Deific Obedience feat. I loved the Chronicle of the Righteous book as well and it's similar system of boons. I can understand why they didn't give the lesser known gods more detail on their boons but I really find myself wanting to write these up. I like a number of the lesser known gods like Groetus, the Elven Pantheon and Milani. This book adds crunch and substance to clerics, a class that can be fun to roleplay but a bit lackluster at times to play in combat.